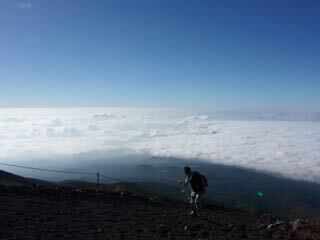 Fujinomiya Climbing Route is 2nd popular mountain trails of Mt. Fuji. The altitude of 5th station is 2400m which is the highest altitude compared to the other 3 routes. It has the shortest distance. Because the routes for going up and down take the same way, it get jammed with people easily on the weekend. The way is mostly covered by hard rocks which is very hard for going down. Parking get crowded so easily on weekend. There is gift shops and restaurant. Rest-house. Available for water, soft-drinks, and some snacks. Hotel Mannenyuki. Opened resting space for un-staying travelers. The highest peak of Mt. Fuji. NEVER TRASH ANY OF YOUR BELONGING. TAKE THEM WITH YOU. Always gives way to those who are climbing up. Food and Drinks at the resting house are very expensive. If you want to stay at those hotels, you need to make a reservation.